Origin, Repercussions and Contemporary Stances. There is not a single (or married) vegan on this planet who does not get asked the Big Question on a fairly regular basis – “How do you obtain protein on a vegan diet?”. It is perfectly understandable, and indeed useful for people to discuss this topic frequently (as long as they discuss it rationally 😉 ), considering that over the last few decades there have been, and there continue to be numerous differing stances and theories on this subject. Since this is too large a topic, I would like to clarify that this article aims to focus specifically on the theories that plant proteins need to be combined based on strictly-defined systems, in order for us to meet both quantitatively and qualitatively the amino acid requirements of our bodies. This concept is so widespread, that we ought to pay special attention to is and analyse it in sufficient detail. “Protein combining” or “Protein complementation” is a rule, according to which we need to consume certain plant-based foods simultaneously, i.e. in one meal, in order to compensate for the “missing” amino acids in each of the individual food items. It is closely connected to the term “incomplete protein” (or “complimentary protein”), which aims to signify that this type of protein source is short of one or more of the so called essential or indispensable amino acids – the building blocks of protein, which the human body cannot synthesize and instead needs obtain through nutrition (a “complete” protein on the other hand is to stand for a type of food item which contains all 9 essential amino acids: phenylalanine, valine, threonine, tryptophan, methionine, leucine, isoleucine, lysine, and histidine). As an example, many websites would recommend eating rice together with lentils, oatmeal – with pumpkin seeds, etc. in order to ensure that you are getting all of the essential amino acids. You would often encounter expressions such as “If you decide to eliminate animal-based foods from your menu, you need to be very careful about creating an adequate meal plan and complementing your proteins”. The consequences of this myth are quiet serious – it results in a widespread notion that in order to be healthy on a plant-based diet, you have to follow strict, complicated rules on a daily basis, otherwise you may just get yourself a case of severe “protein deficiency”. It is hard not to notice the double standard which society imposes when discussing vegan diets. I can guarantee you that no amount of junk food, fried meats and processed foods you eat will get you the same amount of “concerned” comments in regards to the healthfulness of your diet, as an average vegan. Have you ever heard of a person who eats only beans? Or only grains? I can bet good money that the answer is “No”. What is the sense then in scare mongering based on unrealistic scenarios, and in attempting to make inaccurate generalisations about vegan diets as a whole? I have to this day never heard of nutritionist warnings towards non-vegans about needing to be very mindful about how the combine their food, because if they would ONLY eat steak/salmon/chicken meat, they would be lacking in vital nutrients and would be in danger of suffering from scurvy, for example. Let us first of all trace the origin of the Protein Combining concept. In 1971 Frances Moore Lappé published the book “Diet for a Small Planet”, which went on to become a multi-million copy bestseller. The book has international popularity and influence to this day, as it is the first official work, describing in detail the negative influence the meat industry (and in general animal agriculture) has on the environment, as well as the connection between different types of diets and world hunger. Outlining the concept of lowering or eliminating the consumption of meat products, the author also touches on the health aspects of a plant-based diet. She explains to her readers that even though plant foods are not as rich in protein as animal-based foods, through “careful combining” of certain plant-based staples (e.g. combining grains and beans), the human body can obtain sufficient and quality amino acids in the right proportions. What is this theory and recommendation of hers based on? On experiments done on rodents, and conducted over 100 years ago at this time, and chiefly on the findings of two scientists – Thomas B. Osborne and Lafayette Mendel – who in the distant year of 1913 conclude that rats grow faster on a diet based on animal-based rather than plant-based sources of protein. It is then that they introduce the terms “complete” and “incomplete” protein. Rat milk has a 10 times higher protein concentration than human breastmilk. This high amount of protein is necessary to enable and facilitate the fast growth of the animal: a new-born rat needs 4 days to double its weight. How long does a human baby need? Around 4-5 months. The protein concentration corresponds to the speed of growth for the different species of mammals. Homo Sapiens is the slowest growing mammal. One of the most well-established theories at this point is that the exceptionally slow growth rate for humans in comparison to the rest of the mammals is due to the requirement for significant amounts of glucose for the brain of the developing human body. Various studies indicate that the high energy requirements of the brain during childhood are compensated by a slow physical growth rate. This is obviously a highly complex and interesting topic in and of itself, but at present we can safely conclude that the nutritional requirements of a human organism should logically be vastly different from those of growing rats. It is indeed possible that plant proteins are not optimal for rat growth, however – following this line of logic, human breast milk (having a much lower concentration of fat and protein) would not be optimal for them either. Are we then supposed to deduct, that breastmilk is not an optimal nutrition source for humans (at the respective age)? Of course not. In 1975, the book “Diet for a Small Planet” is followed by two articles which go into describing the same principle of plant protein complementation: one in the US magazine “Vogue”, another in the medical journal “American Journal of Nursing”. That if we want to live exclusively on plant-based foods, it is practically a matter of life and death that we combine them the appropriate way at each meal. The irony in this case is that one of Lappé’s main goals was to encourage the nonconsumption of animal products (especially for environmental and humanitarian reasons), however through promoting the “incomplete” plant proteins myth she in fact produced a rather substantial mental barrier for people in terms of switching to a completely plant-based diet. Decades later, numerous organisations and sources still repeat this same recommendation. But what is the contemporary scientific position on this topic, 46 years later? In 1971 I stressed protein complementarity because I assumed that the only way to get enough protein (without consuming too many calories) was to create a protein as usable by the body as animal protein. In combatting the myth that meat is the only way to get high-quality protein, I reinforced another myth. I have the impression that in order to get enough protein without meat, considerable case was needed in choosing foods. Actually, it is much easier than I thought. (…) with a healthy varied diet, concern about protein complementarity is not necessary for most of us. There was no basis for [protein combining] that I could see. And at that point, nobody was saying that you didn’t have to complement proteins. That was something I didn’t understand, and it didn’t make any sense to me. And I began calling around and talking to people and asking them what the justification was for saying that you had to complement proteins, and there was none. And what I got instead was some interesting insight from people who were knowledgeable and actually felt that there was probably no need to complement proteins. So we went ahead and made that change in the paper. [Note: The paper was approved by peer review and by a delegation vote before becoming official.] And it was a couple of years after that that Vernon Young and Peter Pellet published their paper that became the definitive contemporary guide to protein metabolism in humans. And it also confirmed that complementing proteins at meals was totally unnecessary. As part of their report titled “Plant proteins in relation to human protein and amino acid nutrition“, Vernon Young and Peter Pellett expound the facts surrounding the differences between plant and animal proteins, and analyse common myths on this topic. The following table can be found within their report. The food we consume on a daily basis provides us with the fuel and the vital building blocks of our body. There is no doubt that the topic of proper and healthy eating is of great importance and is seemingly more relevant these days than at any other given time in the history of mankind. Our standard of life may be higher than ever before, as is our technological advancement, but unfortunately the lifestyle-related chronical illnesses are no less significant or widespread. It is of grave importance for all of us that we have access to sufficient information in the sphere of healthy nutrition. But it is equally important that we do not let ourselves be misled by the numerous myths, outdated notions, and the intentional or unintentional misconceptions and manipulations abound. It is my sincere hope that this post has demonstrated that the place for the beliefs surrounding “incomplete” plant proteins and the need for “protein combining” (with the connotation most people assign to it) is in the past. 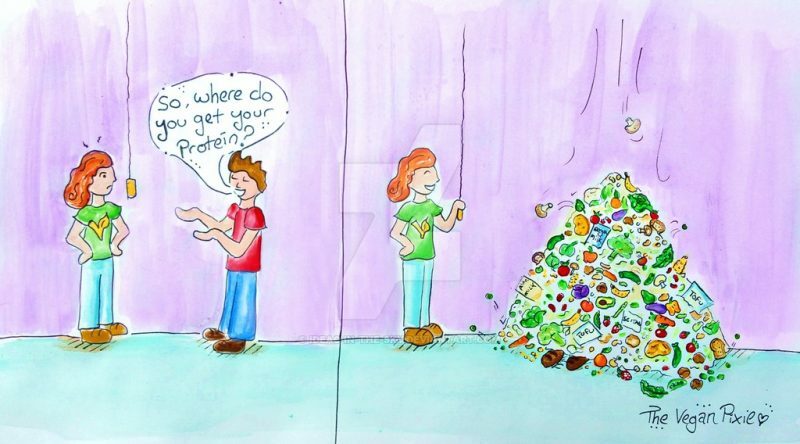 Hannah-Lyz Langley-Rees (2015) So, where do you get your protein? –Kuzawa et al. (2014) Metabolic costs and evolutionary implications of human brain development. // PNAS, vol. 111, no. 36. – Maurer, Donna. (2002) Vegetarianism: Movement or Moment?